I was at a party in Doolin the other night and was hugely enjoying myself through a typical Doolin evening. I was called upon to sing a song and instantly obliged to the limits of my nicotined vocal chords. The applause had hardly subsided, however, before I was approached by a rather large American man in a green sweater whose gripe with me, strongly expressed, was that I was named MacConnell, and that a clansman of mine named Mitch McConnell had been one of the main instigators of a move which almost brought America’s economy to ruins shortly before we met. The large man said he was a Democrat, that both his parents had been laid off work because of the political ploys of Republicans like John Boehner and McConnell, and that I, as a clansman of the said Mitch McConnell, had ruined his evening and should be thoroughly ashamed of myself and my clan. He was very angry indeed. In a general kind of way I keep myself abreast of your political developments, and I was aware of the political existence of Senator Mitch McConnell and his Republican Party prominence at present. I was able to soothe down my angry companion and quickly forgot about the incident altogether because the mighty balladeer Sean Tyrrell stole away the rest of the evening in fine style as usual. But dammit since then, on three separate occasions in Clare and Galway, I have come under fire from some of our many visiting American friends simply because of my politically hallmarked surname. It is not a good time over here — and probably over there too – to be a member of the MacConnell clan. 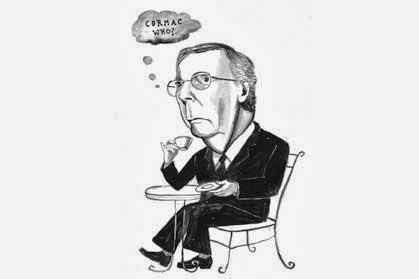 I would like to put it on the record here and now that Mitch McConnell from Kentucky is no kinsman or relation of mine. He is not even a remote 33rd cousin. He comes from a different part of the clan entirely and it is here, dear readers, that the letter “a” becomes hugely significant, not just for the McConnells and MacConnells but for many other Mc and Mac clans as well. This is a fact I have mentioned here before but, given my recent embarrassments must return to again on a point of clarification. In blunt language the MacConnell clan from Ulster are all Papish, disadvantaged socially and economically, virtually landless throughout all of Ireland, more than a little bit cracked and zany, generally harmless unless with drink taken, small of stature both in physical and social terms, likely to play music and sing and dance for no financial return at the drop of a hat, equally likely to become irritated over tiny issues which would not trouble orthodox citizens at all and, in synopsis, a harmless clan. The McConnell branch (*and you will please note the dropped “a” here) are a different outfit entirely, and the aforementioned Mitch McConnell is proof of this. All the Irish McConnells, predominantly located along the east coast of the island and originally hailing from Scotland, are wealthy, socially and economically significant, fundamental Christians of one class or another, and the owners of thousands of acres and properties. They are powerful in business rather than politics in Ireland, are honorable and decent citizens on the conservative side of the scales, and beyond any doubt, would not enjoy the company of the boisterous MacConnell flank of the clan for any length of time. In my wild youth I kissed a McConnell girl from Cavan one summer night after a carnival dance, and clearly recall to this day how cold and tightly closed her lips were. Small clues are significant. I looked up some information on Mitch McConnell before writing this and, beyond any doubt, we are not even distantly related. He is, for example, one of the wealthiest of your politicians, being worth an estimated $45 million at last estimate. That is double and treble the wealth of all the MacConnells lumped together. There is the ultimate truth and there is more. Mitch is of the Baptist persuasion, and there are no MacConnells that follow that particular spiritual coach. He is also a divorcee, though happily remarried I gather, and there are few MacConnells in that camp too given the Papish backgrounds they share. Mitch is also, like many McConnells I’ve met in Ireland down the years, the father of three daughters but no sons at all. The MacConnells predominantly sire sons but the McConnells of Ireland, through whatever genetic device they utilize, create many daughters because, maybe, daughters commonly create lucrative business alliances when they marry. And McConnell daughters in Ireland, like that long ago girl in Cavan, are almost always very beautiful indeed. I hope I have proved beyond doubt that I am not related at all to the McConnell from Kentucky. I wish him well, however, and would be delighted if, despite being now politically downcast, he could find time to issue a one line statement saying he has no clan connection at all with Cormac MacConnell of Clare. And, in anticipation of that gesture, I offer one of my own. It makes no sense at all to me but perhaps it does in Kentucky. It makes no sense to me but I am passing it on for what it is worth!